Rallies were held across the state last month to protest against Barry O’Farrell’s harsh IR laws.Nurses and other public sector workers filled the street outside MP Geoff Lee’s office with ‘Back off Barry’ signs visible as far as the eye could see. 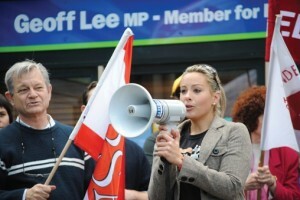 NSWNA Councillor O’Bray Smith addressed the crowd along with other public sector workers. Protesters shut the main street down in Coffs Harbour where approximately 30 nurses joined the rally against the new IR laws. Members from Sydney Hospital spoke out against the IR laws in front of Parliament House on 2 August. They were joined by Opposition Shadow Minister for Industrial Relations, Sophie Cotsis. ‘As a nurse administrator, I’m finding it more and more difficult to recruit nurses. These laws will not help,’ said Ann Ausburn, NUM (pictured right with Pele Lutui-Palmer, NUM) at Sydney Hospital. NSWNA Branch Official and RN Clare Bolton spoke out at the Newcastle rally, which was also supported by Labor member for Cessnock, Clayton Gordon. Opposition Shadow Minister for Industrial Relations Sophie Cotsis addressed an enthusiastic crowd at Kempsey before protesters marched down the main street to MP Andrew Stoner’s office. Branch President Ken Procter, CNS, and Secretary Lynda Binskin of Port Macquarie Base Hospital spoke at an early morning rally at Port Macquarie.